I seem to be spending a lot of time with parenting books lately. It must be something about the ages of four and two. Or maybe it's having two boys, and then having a girl around to show me exactly how much "boy" there is. Of course, it might perhaps just be the fact that we're parents and we have plenty to learn about parenting. Since becoming parents we have particularly seen the value of having an older couple (or an older woman in Titus 2 fashion) around to be able to ask advice of. I must interject here that I've discovered it is a rare person who is willing to offer advice. We are very grateful and feel very blessed to have a few people who we know that we can safely trust with our parenting questions. At the same time, we recognize a distinct lack of willingness for people to offer parenting tips. I'm not sure whether or not there are time constraints or general fear attached to the giving of advice these days, but it is a huge pity and loss of sound counsel which will result in the next generation suffering in terms of wisdom. Including our own kids. I guess in some senses I should not speculate too hard on why it is that experienced mothers aren't offering as much advice/insight when they are in possession of it. Everyone has their reasons, I assume. I also guess that I should be grateful there are parenting books to help the younger, less experienced parent, figuring things out in the privacy of their own home and on their own time. 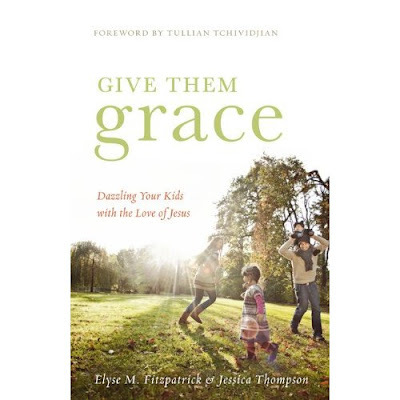 The general idea behind Give Them Grace is that we should parent the Gospel message to our kids. If you want them to love God and follow after Him, you must act as His representative and teach them who He is and how much He loves them through your own actions, rules, speech, etc. Fitzpatrick (and her daughter, Jessica Thompson) would say that you should emulate the love of God to your children. You do this by teaching that He has already paid the price of sin so that they can come to Him, understanding that they cannot be "good" in their own right but can rely on Him to help them learn obedience. This then would be proper parenting. In sending this message to your kids, you are also confessing your own sins and deficiencies (if you have any, that is - ha!) and they see you also relying on the grace of Jesus Christ. In all of this I cannot disagree. It definitely feels like a message that must be ingested to some extent and certainly does not come naturally. (Why? Because we do not live out the gospel message before all men all that easily.) It is true that without the help and saving grace of Jesus Christ we do not really have a chance at "success" in any area of life. As I said, this is a book to ingest and I hardly feel qualified to be reviewing it. (Did I mention that my kids are only 0, 2 and 4?) I'm merely qualified to read this book and think about it! And I'm doing that. I'm thinking about it and we're talking about it around these parts. One thing I rather appreciated "hearing" her say was that we cannot rely on our parenting skills or style to cause our children to want to follow after God. What we say and do, ultimately, does not dictate whether or not they will place their trust in God. Yes, we do have a responsibility and we should not ignore it, allowing our children run amuck and sigh, "Well, it's all in God's hands." But nor should we place a great emphasis on what we have done to ensure obedience. Would you like a chance to wrestle with all of these thoughts as well? Perhaps you need to just as much as I do! I'm happy (ha?) to say that Crossway Books have offered up TWO copies of Give Them Grace to TWO Reading to Know readers. To enter the contest? Simply leave a comment below. This contest will be open through Tuesday, June 21st and is open to U.S. Residents only. Thank you (I think) to Crossway Books for sending me a copy. Looks like a great book. Put me down for the giveaway please. Looks wonderful. Please include me! I am also in the midst of parenting books! Thank you for the recommendation...it will definitely be something to think about! I get nervous when folks start talking about parenting and grace. I see grace translated as undisciplined. I think there's entirely too much "grace" going around in parenting these days. I'm much more of a "law" parent. We have rules: obey the rules equals blessing, disobey the rules equals discipline. I'm not sure how grace enters into that equation. Anyway, I'll move off my soapbox and say this book sounds interesting. Hmm...I want to ingest this, digest this, chew on it awhile. This sounds so interesting. (I love your comment -- "I jest. I think.") Made me smile! Interesting. . .I have this book sitting in a pile to read and review as well, and I'm not very excited about it. . . I fear it will be a case of her raising her kids well, then listening to all the junk so pervasive in our culture and thinking she could have gotten the same results with a more 'graceful/permissive' style. If it ain't broke, don't fix it! As to the lack of people sharing their advice, I think there are a couple generations who didn't have good experiences so don't know what to offer, and the generation ahead of them got tired of offering advice and being scorned in favor of "the experts" and now they are quietly dying. Scratch my name off the giveaway ticket, I'm trying to muster up an open mind to read the copy I have :) but I just had to comment on this review! When you say you don't find experienced mothers offering advice on raising kids, do you mean that when you ask them, they don't have answers for you? Or are you talking generally as in everyday conversations or blogs or books? I'm a little confused, as I see books and blog posts abounding. OTOH, in everyday life, in my experience, not much can get people all touchy and prickly than giving them the merest hint about parenting. I think in everyday life most moms would answer direct questions ("How would you handle this situation?" "Did your kid ever do such-and-such and what did you do?" etc.) But to just interject our opinions randomly seems like we're being opinionated busybodies. Plus sometimes we're aware of our own shortcomings and failures and feel like we don't have any advice except on what not to do. No one feels like an expert just because they've raised kids, or at least few do -- most of us feel that if they turn out right it's only by the grace of God. I've only read a bit of Fitzpatrick -- one friend reads her a lot and I've read a couple of blog posts she has linked to her. I'm not settled in my opinion yet. I do think we have to teach and model grace, but sometimes the"law" is what makes us feel out need of grace. That said, don't enter me for the book -- I have too much else stacked up now and it might better suit someone who is in the thick of parenting than someone like me nearing the end. This one has been on my wish list...so please include me! I would be very interested in reading this. I have a 4 and 3 year old and a 5 month old, and some days (most days?) I feel like I'm making it up as I go along. Sounds like something I might need to read. Count me in! Most importantly, I found I have to learn WHICH Christians to listen to- people who have housekeeping and children/personality styles similar to mine. (Twins are a plus.) Some people prefer more flexibility than I do- some less. Some people have more defined male/female roles- some less. Some people have different views on finances. While I was pregnant, four people in my aisle at work had children graduate from high school. I've observed their kids over the last 5+ years and they've all turned out, as far as I can tell, fine. It definitely seems that most of the differences that mature, two parent families stress over are not terribly important. Now if I can only model how to love God- oldest son just informed me he loves cookies more than God this afternoon. I think this sounds like a very interesting read. Thank you for the review. I would love to read this. I'd love to read this. My husband and I have been discussing grace vs. law quite a bit lately. Thanks for the giveaway! The older I get, and the older my kids get, the more I realize how many mistakes I made and how many things I did wrong, at least in terms of what the prevailing standard of a good parent is/was. In other words, I should have messed up my kids royally and the only reason I didn't is because of the Lord's mercy and grace. Anyway, I just ordered two copies of this book, one for me and one to give as a gift to a dear friend expecting her first. May we both--she at the beginning of her parenting and me hurtling toward the final climb--learn to be gracious even as we have been granted grace. Yes, there must be discipline but oh how we need the grace. The Lord is so good! Sounds like a book my daughter would love to read - with 3 girls 3 and under!! I would really like to win this book! Yes, please. My brain doesn't feel up to the task of thought-wrestling, but I'd try. Thank you so much for the chance to win this. This sounds like a great book. I would enjoy reading this book. Thanks again. Sounds like a great book. Please enter me for the giveaway. A woman who I really respect says that this is the best book on parenting she's ever read (her kids are now college and post-college). I bought it for my expecting SIL and am interested in hearing what she thinks. I just went back and read my thoughts on the book and I point blank say that I don't agree with everything, but that it has a incredible point to make. I'm on my second batch of kids. First three are well adjusted teens and the second batch a set of 7 year old twins we adopted in the last year. I was at a loss to know how to present Jesus to the twins when they were not raised in their formative years in a home that even knew Him. I could tell them the stories and sing them the songs, but they were missing a huge foundation.... and you are right, it's a ton of work, but I believe that in the end it will transform us as well, because we cannot give them the gospel if we have not done our study and have an ongoing and productive relationship with Jesus. It will push us.